The walks are never too difficult or too long and the talk is first class. We usually stay on mainland Lewis! Every Tuesday (weather permitting) we meet in the hall car park at 2pm and take it from there. Come when you can, it does not have to be every week. All ages are welcome and although we have nothing to do with ABC Club, we have some enthusiastic members who also belong to the ABCs. Men are also welcome. Think of the interesting talks you could have about sheep and fanks while you enjoy the beauties of nature. Give it a thought! Each year we go on a walking holiday. 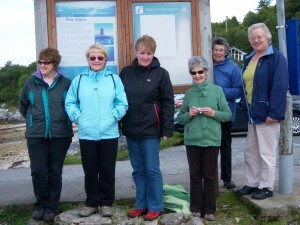 Since we started our walking club we have visited Uist, Skye and this year went to Oban. 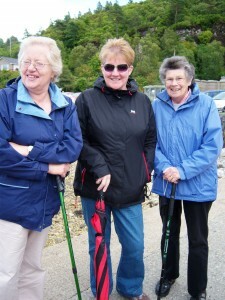 This year the Walkie Talkie Group took the road to Oban. We stayed in Connel, a small village 6 miles out of Oban. On the first full day (Tuesday) of our walking holiday the Group decided to go to the island of Lismore. To get to Lismore we had to take a short ferry run from Port Appin. Port Appin is a small village with one hotel at the pier and maybe two shops and a handful of houses. The scenery is spectacular. After waiting an hour, it was decided that the sea was just a tad choppy. We can walk and talk in all weathers but sailing requires excellent conditions – some of us are not good sailors, even if it is only five minutes on the ferry! The decision was taken to leave our Lismore outing for another day. Instead we explored Oban itself and took a walk towards an unused priory, a beautiful walk. On Wednesday the weather was excellent for our visit to the Isle of Kerrera. Beautiful landscape. Not much traffic on the roads. After walking for three or four miles we arrived at an old croft house where we had refreshments. While we were eating, the resident chickens wandered around under the tables. (Not good). One person in our group hates chickens! Guess what! They loved her. We had planned to walk round the island but we were told that the path was very difficult in parts, so, sticking to the route was advised and after getting lost in Shawbost only a few weeks ago, straying from the path is not a good idea! When we arrived back at the pier for our return to Oban the ferry was just arriving. For some in the group it is more difficult to keep up the same pace as the rest. The ferry was just drawing away from the pier when we asked the ferryman (Duncan) if he would go back for the others as they had just arrived at the pier. No problem for Duncan. He turned the ferry round to pick them up. What a hero! On Thursday we eventually made it to Lismore. Hooray! Again we had stunning weather. We had walked a few miles when we came across a crofter in distress. He was transferring sheep from one field to another. He had a young lad with him and a couple of sheepdogs. No use. 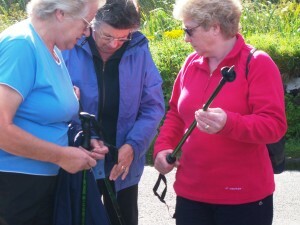 There was nothing for it but for Anne (Paddles) and Chrissie Bheag Riverdale to help the poor man with his flock. You should have seen them! Walking sticks in the air and the two of them making strange noises. You would have been proud of them. Sheep sorted we went on our way. What a beautiful island. We must have walked at least seven miles. We all got a little bit sunburnt on our walk that day. On the Friday it was time to return home. We thoroughly enjoyed the walks and the scenery in and around the Oban area. We enjoyed it so much we are hoping to return next year to explore more.